Genuine real life photo of a yeti! ​ A few weeks ago, several news websites including the BBC, The Independent and The Guardian ran a story on the latest Scientist to analyse Yeti samples. Stories of the abominable snowman, a mysterious creature inhabiting the Himalayas, have been circulating for about 200 years now. Sightings have been reported and tracks have been photographed but, at the time of writing, nobody has caught a yeti. So the question is: do we believe in Yetis? Let me be clear, I would love yetis to be real. And, just to put it in context, cryptid creatures really are discovered occasionally. Giant squids and okapis were both mystery-creatures until fairly recently. Could yetis be next on the list? Well, maybe. It would be foolish to say “yetis definitely don’t exist” because someone might find a yeti carcass the next day and you’d look like an idiot. Yetis aren’t a matter of opinion either because they either do or don’t exist and, strictly speaking, it’s a testable idea; we really could carry out an enormous experiment to confirm or disconfirm their existence (observing every square foot of the Earth simultaneously would do it). For now though, we have to be honest and say we don’t know if yetis exist. But if we wanted to place a likelihood on it - to say whether such a creature was probable or not - how could we do so? At present, yeti evidence falls into three categories. 1) Body samples: People have found chunks of bone, flesh and hair claimed to belong to a formerly living yeti. The most recent investigation on such a sample was carried out by Eliecer Gutierrez and Ronald Pine, who published their results in Zookeys issue 487 (which you can find online for free). The conclusion they came to via DNA analysis is that supposed yeti hair samples can be identified as coming from Himalayan brown bears...or, they come from yetis after all but yeti hair matches bear hair by coincidence. 2) Footprints: A lot of photographs and casts have been taken of unusual tracks found in Himalayan snow. The size of the footprints, their angle and the distance between them don’t match any known animal. So, none other than Edmund Hilary (the first man to reach the summit of Everest with Tenzing Norgay) investigated the tracks and explained his findings in the January 13th 1961 edition of Life magazine. Hilary followed several apparent yeti tracks and discovered that they belonged to dogs. As the dogs raced through the snow, the bounding of their feet meant several paws would hit the powder in the same place at the same time, creating enormous shapes at unusual distances and angles from each other. So the footprints could be explained as belonging to dogs…or, they were made by yetis and the dogs happened to be in the area. 3) Sightings: Since the early 1800s, many people have reported seeing hair-covered creatures walking in the Himalayas. Himalayan brown bears (and a few other bear species native to the area) will sometimes walk on their hind legs. Add to that, human sensory systems working poorly at higher altitudes where there is less oxygen, and a higher rate of hallucination. It seems quite likely that the various sightings have been bears and blurry eyes…or, yetis. We have a decision to make. We can explain all the yeti information as bears, dog-footprints and human misperception…or there really is a species of unidentified ape-creatures living in the Himalayas who have never been reported in detail prior to the 19th century, leave no identifiable remains, leave no droppings, have never been clearly photographed or filmed, and have managed to survive in a harsh environment for two hundred years while somehow keeping their population density extremely low. “The hypothesis with the fewest assumptions should be chosen until you know better”. Occam’s razor says if you have two equally plausible, equally evidenced hypotheses and no way to distinguish between them, go with the one requiring the least number of mental leaps. This does NOT mean the simpler hypothesis is definitely correct. Indeed, it might wrong. But until evidence comes along to support one explanation over the other, Occam’s razor says you’re better off going with the simpler one. In the case of yetis we either accept a hypothesis in which bears exist, footprints can be misinterpreted and human eyesight can be fooled (a hypothesis with no leaps of faith) or we accept that never-before-seen animals exist and have avoided detection against all odds (quite a big leap of faith). 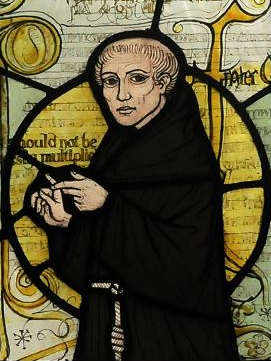 William of Occam. We don't know if he was preparing to fight a yeti when this stained glass window was taken...but he probably was. The simplest explanation isn’t always the correct one, that's true, but the number of times an unusual explanation has turned out to be right is fairly small. If we don’t use Occam’s razor (and go with the more outlandish idea) then we're introducing the notion that mental gymnastics to explain an otherwise simple finding are a good way to go. We might suggest that Yetis can turn invisible when they hear us coming. Or turn into trees, or even fly. Perhaps they can teleport to the moon. All these hypotheses are consistent with the evidence: no yetis found, but they all require us to take enormous mental leaps in order to hang onto them. At this point it starts to sound more like desperation rather than reason. Occam’s razor can be misused or misrepresented sometimes. It isn't a way of deciding if a hypothesis is true. It’s also not an unbreakable law of Science. But when you have two plausible explanations for something, the chances are the more straightforward one is going to be right. While I want Yetis to be real, I have to go with Occam’s razor and not my preferences. Are yetis real? I don't know, but unfortunately, I doubt it.